General William R. Looney III, a recently retired Four-Star General with the United States Air Force, knows how to lead. Retiring from the Air Force after 40 years of service as one of the most recognized leadership authorities, General Looney has commanded more organizations than any other Air Force general, past or present. Looney doesn’t simply talk about leadership; He has lived it. During his time in the Air Force, he led the Air Force Academy Cadet Wing, a fighter squadron, 2 fighter wings, an academic institution, a warfare center, a numbered air force, 2 acquisition centers, and a major command while rising to the highest rank in the military - 4 star general. The organizations he led covered every facet of Air Force activity including operations, training, education, and acquisitions involving as many as 100,000 people or as few as 13. Without fail, every organization he led achieved at higher levels of performance and productivity. Having successfully managed and led during critical times of global tensions, he also knows a little bit about how to bring people together for a common goal. “To create a world class organization that thrives, it takes leadership that inspires and motivates the workforce,” states Looney. He will share how he accomplished this many times over in various organizations through entertaining stories engaging his audience at every level; discussing attributes of successful leaders and sharing real strategies that he has implemented throughout his career. Looney graduated from the Air Force Academy in 1972. He is a highly decorated officer with over 4,200 flying hours, 62 in combat, and 2,500 in the F15 Eagle. 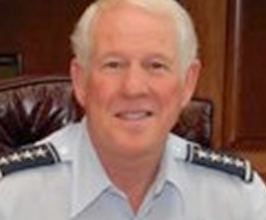 His final command concluded at Randolph Air Force Base in San Antonio, TX. He and his wife, Marilyn, have two daughters, two sons-in-law (both Air Force officers and pilots) and two grandchildren. General Looney travels from San Antonio, TX. All American Speakers is a speakers bureau and booking agency providing information on booking General Bill Looney for speaking engagements, personal appearances and corporate events. Contact an All American Speakers Bureau booking agent for more information on General Bill Looney speaking fees, availability, speech topics and cost to hire for your next event. Please Note: All American Speakers Bureau acts only as an entertainment broker/producer for corporate functions, private engagements and special events. All American Speakers Bureau does not claim or represent itself as the exclusive agent or management of General Bill Looney or any artist on this website. Speaker fees are determined based on a number of factors and may change without notice. Fees often vary based on a number of factors including: speakers schedule, supply and demand, length of presentation, location of event and other factors. Fee Ranges listed on this website are intended to serve only as a guideline. In some cases, the actual price quote may be above or below the stated range.